The ultimate BMX Racing summer camp took place during the week of August 17-23rd at the Chula Vista Olympic Training Camp. 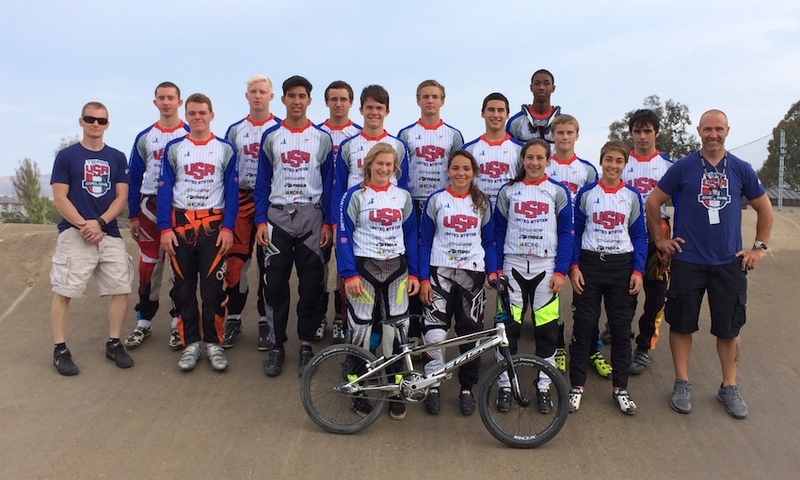 Chase Bicycles and Tioga partnered up with USA Cycling for the BMX Development 4 Camp series in 2014. The camps are held at the USA Olympic Training center in Chula Vista, CA. Riders qualifying through the USA BMX race series, are given the opportunity to attend the OTC for the Camps and learn from some of the best in BMX on what the transition is like from Amateur BMX racing to Elite level racing on Supercross style tracks for the World Cup tour, as well as the proper training, nutrition, and recovery techniques. The Devo riders are given the opportunity to live at the OTC for a week, along side of current Olympic and Olympic hopeful athletes from all types of different sports at the OTC, and get the experience of what its like to be a world class athlete. The riders attend seminars about Race Training, Nutrition, Weight Training, Sports Marketing, Social Media, and Bike Maintenance. Each of the riders are initially tested at the start of the week to get base line results and help for the coaches to determine what they need to improve on the become a better racer. The Devo riders then get to train on the Supercross tracks at the Chula Vista OTC with the major focus on the Beijing replica track, as well as 1 day of riding on the advanced SX London replica track and a night at the USA BMX Chula track. At the end of the camp, the riders are put through a race simulation on the Beijing track to test what they learned. Each of the USA Cycling Devo camps also serves as a talent ID camp for the coaches to find potential riders to be invited back for more advanced camps in the future for advanced camps. For the 3rd Camp of 2014, there were 16 Development riders in attendance: Female riders – Kristen Klein, Elida Beeman, Shayla Blackmore, and Sophia Foresta. Male riders included – Anthony Martinez, Caleb Wall, Jaiden Fox, Anthony Lucchesi, Richie Dey, Dougie Butcher, Michael Boyle, Austin Palasota, Bubba Gonzales, BJ Ensey, and Trae Proctor. Coaches- Kenth Fallen, Jamie Staff, and James Herrera. Devo Camp Head Coach Arielle Martin was not in attendance, due to the birth of her first child but was calling in and helping the crew from home. We would like to thank our supporters for sending items for the Camp riders. Companies include Kicker, ODI, Shimano, Insight, Elevn, Tioga, Chase, and Fly Racing. About Chase Bicycles: Chase BMX frames and complete bikes were created to bring the BMX racing world a new standard for the Elite level of BMX racing frames. No gimmicks, just straightforward technological advancements to offer you the lightest and stiffest frames. These advantages allow you to get all the human generated power to the ground, and give you the biggest advantage offered from any current BMX frame – The winning advantage. About Tioga: Tioga is one of the originators of the BMX racing tires. Starting off with the Comp 3, Tioga has lead the industry for almost 30 years with the worlds best tires. Tioga now Produces the PowerBand and PowerBlock – The ultimate BMX racing tires, designed to efficiently transfer pedal power and other rider inputs into lateral motion. In short, you’ll roll faster with less wasted energy. The S-Spec version utilizes Tioga’s thinnest sidewall for maximum suppleness and weight savings. Size for size, the S-Spec are the lightest BMX tires in the world. About USA Cycling: The vision of USA Cycling is to make the United States of America the most successful country in the world of competitive cycling. There is 1 more camp for 2014. Visit the USABMX.com website for points tracking info.